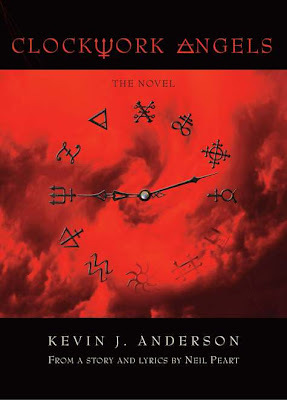 ECW Press have announced two very special, limited editions of “Clockwork Angels: The Novel,” the side project of the latest Rush album. The Silver Edition, slipcased and autographed by authors Kevin J. Anderson and Rush drummer/lyricist Neil Peart, will be available in a limited edition of 300 copies. It will be available for $74.95 from ECW Press and rushbackstage.com. The Gold Edition, slipcased and signed by both authors, is accompanied by a lithograph image from the book, signed by artist Hugh Syme, and a unique autographed page of the original Clockwork Angels manuscript. Both pieces are presented in an attractive frame with an engraved and numbered plate. With only 302 copies available, the Gold Edition will retail for $299.95, and be available exclusively from rushbackstage.com. The Gold and Silver editions of "Clockwork Angels: The Novel" will be available for preorder on Friday, July 27, at 10 AM ET, while quantities last. Special editions will ship on August 31. The standard edition of “Clockwork Angels: The Novel” will be published September 1. "For more than twenty years, Neil and I have wanted to collaborate on something MAJOR, a way we could tie together our imaginations, and at last that's happening,” said Anderson when the project was announced. Rush will introduce “Clockwork Angels” to fans when they kick off their North American Tour in Manchester, NH. on September 7.